Ireland eased past Italy winning 36-6 in Dunedin to set up an epic quarter-final with Six Nations counterparts Wales. The boot of Ronan O'Gara gave them the edge at half-time before a try from Brian O'Driscoll and a double from Keith Earls was enough to secure Ireland's spot in the knock-out stages. Despite enjoying substantial time on the ball, Italy failed to cross the whitewash and their sole points came from the boot of Mirco Bergamasco. Winger Tommy Bowe was the unluckiest player on the pitch after having one legitimate touchdown disallowed and being refused a penalty try in the final throes of the game. But many of Ireland's big-game players delivered with Stephen Ferris and Sean O'Brien, the man of the match, rampant and Gordon D'Arcy exploding back into life with his best performance for some time. The decision to select Conor Murray also paid off with the Munster rookie looking a class act, offering Ireland an attacking threat at scrum-half they have rarely possessed. Italy were hoping to reach the knockout stages for the first time, but their limitations were exposed and they never looked capable of causing an upset. Adding a sinister element to the showdown was Leonardo Ghiraldini's apparent eye-gouge attempt on Cian Healy, an incident that was missed by referee Jonathan Kaplan but will surely interest the citing commissioner. Some of Italy's play was borderline, with most of their darker moments seemingly directed at Healy, who proved infuriatingly brilliant. Once again Ireland's huge travelling support effectively turned the contest into a home game with most of Dunedin's new sporting arena bathed in green. Much of the build-up concentrated on the claim made by Italy coach Nick Mallett that the Azzurri boasted a better front-row and that they were ready to prove it. That dominance at the scrum failed to materialise with both sides enjoying periods of superiority without ever taking full control. Two early scrums saw Ireland hold firm while in open play they made all the running with Ferris, O'Brien, Rob Kearney and O'Gara making inroads. O'Gara landed three points to reward their effort, only for Ireland's scrum to then come under heavy pressure and concede a penalty that Mirco Bergamasco sent between the uprights. O'Gara and Bergamasco exchanged penalties, the latter coming after the Azzurri had staged a line-out catch and drive that swept them to within inches of the whitewash. Ghiraldini then made his apparent attempt at eye-gouging Healy, provoking a furious response from the Ireland prop. O'Driscoll spoke to Kaplan, but the South African official had not seen the incident. Not for the first time Murray darted into space and Ireland were unfortunate to have a try disallowed for a forward pass from O'Brien to Bowe. 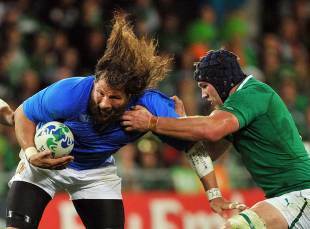 Italy suffered a double setback when talismanic prop Martin Castrogiovanni limped off while O'Gara booted his third penalty. All the rugby was being played by Ireland, yet they were unable to pull clear of determined opponents. Bergamasco missed a penalty and then watched his brother Mauro go on the rampage, landing a series of punches on Healy before flying into Paul O'Connell. Just seven minutes into the second half Ireland had extended their lead to 10 points. O'Gara kicked a penalty and converted a beautifully worked try by O'Driscoll, who trailed Bowe as the Ospreys winger worked a gap in midfield. While in the process of being tackled, Bowe slipped a pass to O'Driscoll on his inside shoulder and the skipper galloped home. Five minutes later the second try arrived with D'Arcy showing strength to make the initial inroads. Ferris was twice involved in the move, including fixing his man and popping the scoring pass to Earls. O'Gara added the conversion. Kearney was denied by a try-saving tackle and when O'Gara was substituted, Jonathan Sexton accepted the responsibility of keeping the scoreboard ticking over by landing a penalty. Italy rallied in the last 10 minutes as they pounded away at Ireland's line, but the drama continued to occur at their own line. Bowe fly-hacked the ball on but was tackled by winger Tommaso Benvenuti while in the process of diving for the ball. It should have been a penalty try but Kaplan was unmoved. There was still time for Ireland to cross once more, however, with Andrew Trimble delaying his pass to Earls perfectly, allowing the Munster winger to dive over with Sexton converting.